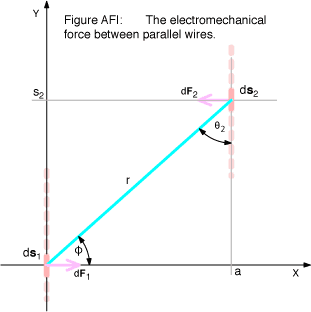 A guide to the electromechanical force produced between two lengths of wire. The earliest important contribution to the theory of electromagnetism was Coulomb's Law. It specifies the magnitude and direction of the force between two stationary electric charges. When the charges are in motion, however, you need to invoke more complex theory: Ampère's Force Law (AKA Ampère's Law of Force; not to be confused with Ampère's Circuital Law). We ascribe this alteration to the force that occurs when electric charges move to magnetic fields. Put simply, Ampère's Force Law does for magnetostatics what Coulomb's Law does for electrostatics. 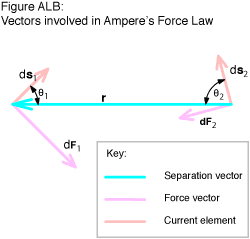 Ampère's Force Law is seldom used directly for practical engineering purposes. Its real value is to form the basis upon which to define the unit of electric current. You can derive the Force Law by substituting the magnetic field value given by the Biot Savart Equation into the motor equation. Indeed, practical calculations of the electromechanical force usually take this approach, which you can also extend to include inhomogeneous media. All of what follows applies only to 'free space' environments. Ampère's Force Law is of no use in the presence of magnetizable materials. However, the Force Law has the advantage, as a means of defining the ampere, that it is independent of any definition of a magnetic field. Magnetic flux density may instead then be defined in terms of the ampere. Coulomb's Law employs the notion of 'point charges'. They form a basis upon which, through a process of summation, models of more complex, 'real world', electrostaticaly charged bodies may be constructed. Similarly, Ampère's Force Law is based on current elements. Like the point charge, a physical realization of an isolated current element is impossible. In principle, however, real electric circuits can be described as assemblages of these current elements. A current element may be pictured as an electric conductor carrying a definite value of electric current, I. It also must have a very small, but definite, length, ds. It must also possess negligible thickness. The terms 'very small' and 'negligible' here mean with respect both to curvature of the actual wire of which the element forms a part and also to the distance, r, separating the current element from any other element within some separate circuit carrying a different current. Ampère's Force Law specifies the magnitude and direction of the magnetic forces acting upon two such current elements in proximity to one another. Such forces are represented naturally using vectors. The differential length of the 'current element' from within the first circuit. It takes units of metres. The 'current element' from within the second circuit. The separation, in metres, between the current elements. Here considered positive when drawn from element 2 to element 1. A dimensionless unit vector in the direction of r.
The differential force, in newtons, exerted upon current element 1 due to the field generated by current 2. The force exerted upon current element 2 due to the field generated by current 1. Figure ALB shows a simple case where both current elements are coplanar. Only in such cases will both force vectors be coplanar with the current elements. Observe that these forces are neither opposite nor equal. Claims were made that this violated Newton's Third Law of Motion. The original formulation by André Ampère was in accord with old Fluxions Face, but the Force Law as it is today prevails because it better fits the field theory of magnetism. It was a storm in a theoretical teacup because both forms give the same results when applied to real circuits. where km or κm is known as the magnetic force constant. At least one other writer (Dugdale) chooses a value double this through Equation AFG. When you need to find d2F2 then swap the subscripts in equation FLD, and take ur to be positive along the line from element 1 to element 2. Should you feel the vector equation is hard to untangle then a step-by-step description may help. Rather than trying to imagine how the Force Law operates in one go, it is easier to break it down into two stages: first calculate (perhaps using the Biot Savart Equation) the magnetic field created by element 2 at the position of element 1, then calculate the reaction of element 1 against that field. To find the direction of the force on element 1 due to element 2, consider first a plane containing element 2. At every point within that plane the field due to element 2 ('field 2') will intersect it in a direction normal to the plane. This is true of all planes containing element 2. The field lines are coaxial with the current element. Now, unless the current elements share an axis, there will always be one, and only one, plane within which element 2 sits which also intersects element 1. So, at the location of element 1 field 2 will be normal to the same plane. If you're still clinging on then it's time to switch planes. Consider, in specific, the one containing both the field 2 direction and the current 1 direction. Got it? Good, because, finally, the force on element 1 is normal to this plane. One consequence of all this is that dF1 and ds2 will be coplanar, even when ds1 and ds2 are not coplanar. You may point out that any two vectors bound to a common origin are coplanar. However, dF1 and ds2 are free vectors without a common origin; so their coplanarity holds significance. The same holds true for dF2 and ds1. 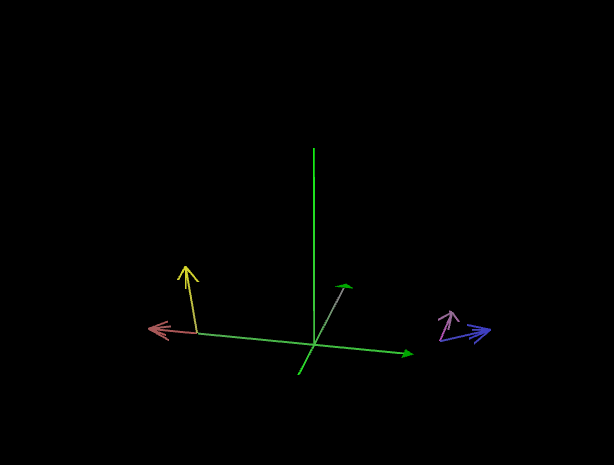 The QuickTime animations here may help you to visualize the forces. 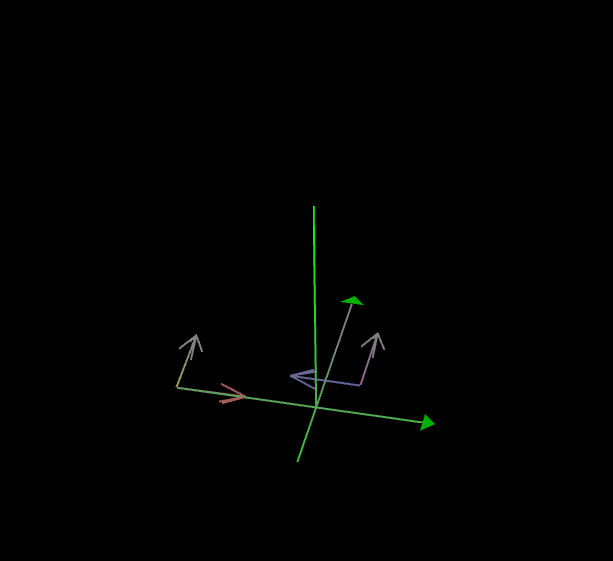 All vectors involved in the first animation lie entirely within the X-Y plane. The first current element in it, shown (foreshortened) in purple, is fixed parallel to the Y axis. The second current element, shown in yellow, sits on the negative X axis but rotates within the X-Y plane. Because the elements are coplanar within the X-Y plane the magnetic field generated by one element has a component only in the Z direction everywhere within that plane, including the location of the other element. The force (whose vector is shown in red) upon the yellow current element simply rotates round with the element. You may verify this with the left hand rule. The force (shown in blue) on the purple current element reaches a maximum twice each cycle when the yellow current is broadside to the red current (not when the currents are parallel). Furthermore, the force direction is one of attraction between elements when the currents flow in the same direction and one of repulsion when the flows oppose. The blue vector vanishes completely twice each cycle when the yellow current points toward the red current. This may be understood in terms of the sine of the angle between the separation vector (not shown) and the yellow current. The second animation again features a stationary current element depicted in purple. It too rests in the X-Y plane, parallel to the Y axis. The other current element is again located on the negative X axis. This time, however,the yellow current direction is rotating within the Y-Z plane. The salient feature of this geometry is that the separation vector remains almost normal to each current. Each current therefore experiences the greatest field strength deriving from the other. 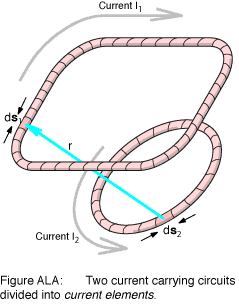 The blue force changes as the field from the yellow current rotates from being almost parallel to the purple current (minimum force) to normal to it (maximum force). The force never quite goes to zero because the purple current is offset a small distance away from the X axis; so the field in which it sits is never exactly parallel to the current direction. More complex geometries require numerical methods, but the 'parallel wires' problem may be solved analytically. Field lines produced by wire 1 which intersect wire 2 do so at right angles both to wire 2 and a line joining 1 to 2 normally, and vice versa. where a is the separation distance of the wires. Last modified: 2008 June 15th.